During the late summer into early Autumn months we are blessed to have peppers galore! In the 2016 vegetable garden I totally cut back only planting two rows that were about 10 feet long. 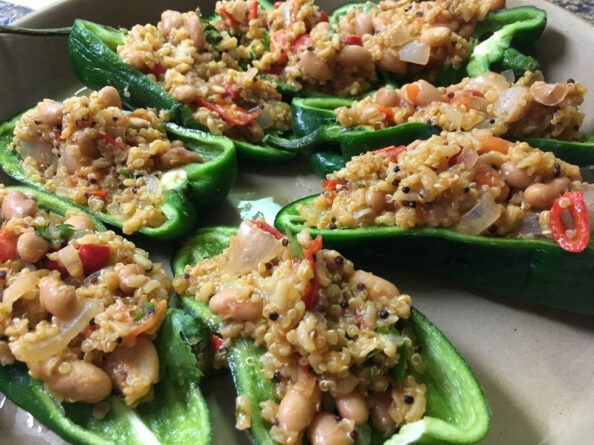 My family loves this Quinoa & Bean Stuffed Anaheim Peppers recipe I came up with using what we had in the garden and pantry. Peppers are always my ‘super heroes’ in the garden as the growing season outdoors comes to an end. Curious about the jalapeno cracks? The cracks usually appear when the pepper starts to turn from green to red. I find with the jalapenos I grow the peppers with cracks are something hotter to taste. Since I grow peppers, toward the end of the season I get very creative when adding them to menus. I will put the anaheim peppers in breakfast, dinner and lunch on some days. This pepper variety is mild, sweet and packs a little kick later in the growing season here in Ohio. 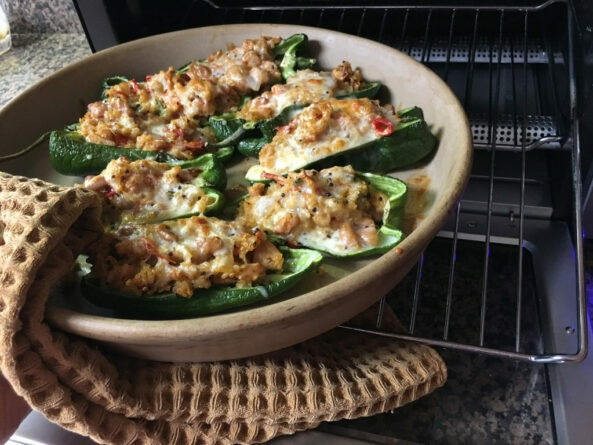 Below is a healthy twist to the traditional stuffed green peppers I grew up on. You can omit the cheese in the recipe below making it totally vegan! 1 tablespoon of southwest spice. (1 teaspoon cumin, 1/2 teaspoon pepper, 1 teaspoon chill season, and dash of salt). Slide Anaheim peppers in half and place on oven safe dish. In skillet saute onion and sweet red pepper. Slowly add the chopped tomatoes with juice and pinto beans. Stir and cook 5 minutes. Add seasoning and cook additional 5 minutes adding water if needed to provide moisture. Mix in cooked quinoa and 1/2 cilantro. Carefully scoop mix into the pepper on dish. Sprinkle cheese on top ( optional) and cook in oven for 20 minutes or until the pepper edge looks a little brown and the cheese is melted. Most peppers are high in Vitamin C, A and B so they are good for you. I recommend the Anaheim pepper for home gardeners because it is easy to grow in raised beds and out in a traditional vegetable garden that gets full sun. Peppers : sweet reds are from my geodesic bio dome and the green are from my traditional garden. 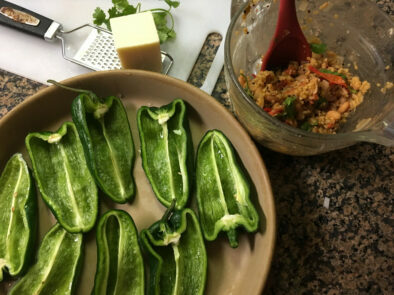 Below are a few of the photos I took with my iPhone while preparing the Quinoa & Beans Stuffed Anaheim Peppers recipe. I wish you could smell the kitchen when the fresh vegetables are being sauted and then baked in this recipe. Instead of turning on the big oven to bake these dish I used my Kitchen-aid toaster oven. 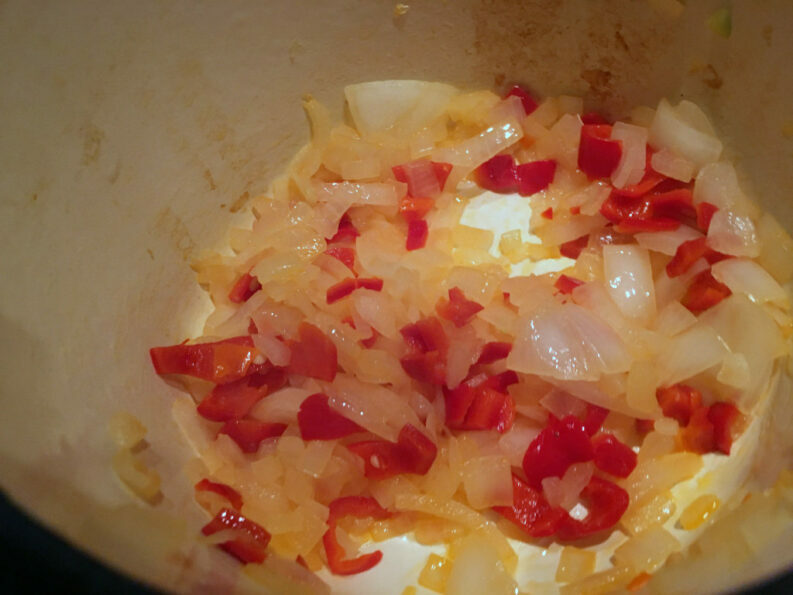 Onions and sweet red peppers in skillet with olive oil. 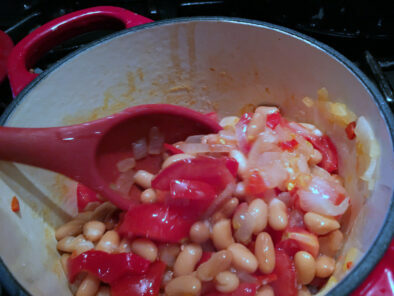 Beans and tomatoes added to the onion saute mix. Anaheim peppers ready to be stuffed after seeds are removed. I used my toaster oven to bake these. With all the nutrients value and how easy it is to grow Anaheim peppers I hope you will consider adding them to your home garden in years to come. In the meantime, I’ve found some really great looking Anaheim at local produce departments. Costco had a super size bag that I’m considering purchasing once my garden is put to rest for the winter. [alert-warning]As I shared above I’ve been growing this pepper variety since we moved out to the country in 2003. I can’t imagine not having a few of these pepper plants to enjoy each summer. Not a year has gone by that we didn’t harvest a few dozen to enjoy. I’d love to share my experience with you so be sure to connect with me on social media or leave a comment on this post.